By forcing secret donors into the light, progressives hope to scare them away from election giving. 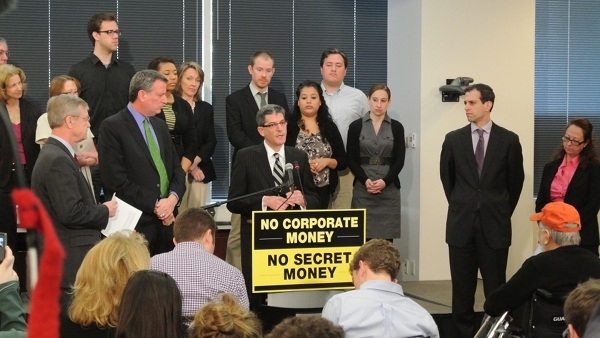 The announcement of a campaign to expose secret donors, Monday morning in Washington. Photo courtesy HCAN. Short of an outright ban of corporate money from elections, disclosure is perhaps the best antidote to the political influence of big business. Notably, since Super PACs disclose donor information, only one-half of one percent of all contributions to the most active Super PACs this campaign season came from publicly traded corporations, which are naturally sensitive to coming under attack for political activities. Business interests instead prefer the type of electioneering practiced by nonprofits like the US Chamber of Commerce, which is planning a $50 million campaign to influence House and Senate races coast to coast this fall—and they won’t have to disclose where a single dollar came from. With that in mind, a coalition of public interest, labor and progressive groups announced today a major, fifty-state campaign to force disclosure by any means possible. The headline-grabbing element of the plan is a $25,000 reward, offered by Americans United for Change, to the first employee who documents that his or her employer is using corporate funds to contribute to a non-profit that buys election ads and doesn’t disclose donors—such as Karl Rove’s Crossroads GPS. But the groups plan to use a wide array of other tools to force disclosure, from shareholder actions to regulatory and legislative pressure. As companies are outed as political donors, the strategy is to use immense public pressure, including perhaps boycotts, to shame them and hurt business—which happened, for example, to Target when it was revealed in 2010 that it was giving money to an anti-gay candidate. “What happened to Target was child’s play compared to the strength that all of these organizations can bring to bear against companies that decide they’re going to go against the people’s will and involve themselves unduly in the political process,” said Bill de Blasio, New York City’s public advocate, at the announcement of this campaign in downtown Washington this morning. “Just ask Rush [Limbaugh] what happens when you do something that violates the values of the majority of people in this country,” said Ethan Rome of Health Care for America Now. If all goes according to plan, once the coalition gets a few scalps, the fear of being outed will help keep corporations on the sideline in the upcoming elections and beyond. “For many CEOs, it’s secrecy or no go. They won’t spend the money because they know the reputational harm that will come,” said Robert Weissman, president of Public Citizen. “There is damage that will come from inflicting damage on America’s voters,” said Rome. The coalition stressed that the campaign will target donors to any campaign—Republican or Democrat. “Let the chips fall where they may,” said Bob Edgar of Common Cause. The participating groups and individuals are: Common Cause, Public Citizen, New York Public Advocate and New York City Pension Fund trustee Bill DeBlasio, Coalition for Accountability in Political Spending (CAPS), Service Employees International Union, MoveOn.org, Americans United for Change, Public Interest Research Group (PIRG), USAction, Sierra Club, Campaign for America’s Future, National People’s Action, Progress NOW, Every Child Matters, Health Care for America Now and Occupy Wall Street.